Healthy Greek yogurt recipes you have to try. Nonfat or lowfat plain Greek yogurt has more protein-per-calorie than most other protein rich foods, like beef, chicken or fish. It’s one of the foods I have daily in my diet, normally with my oatmeal, with fresh fruit or mixed into my post-exercise recovery smoothie. I also love using it as an ingredient to make many of my recipes healthier–from tuna salad to frosting and even creating a fat-free “cream” sauce for pasta (see recipes below) or a lighter cheesecake. Check out the guide, 10 Best Ways to Enjoy Greek Yogurt, for ideas and inspiration. 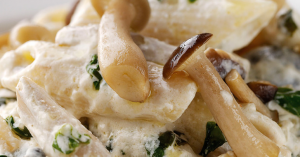 Stir the pasta into the mushrooms and reheat. Season to taste. Add the Greek Yogurt and stir well. If liked, Parmesan cheese can be sprinkled on just before serving. Serve piping hot and garnish with fresh herbs. 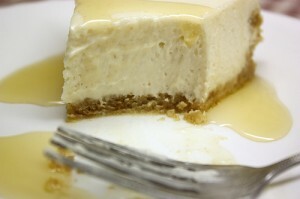 Here’s a great cheesecake recipe to try that slashes the fat and calories compared to a regular cheesecake. Filed Under: FEATURED ON PAGE, HEALTHY BITES, RECIPES Tagged: Greek yogurt, greek yogurt recipes, healthy greek yogurt recipes.